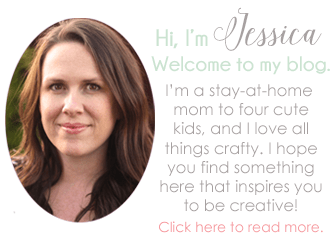 With all the crafting I do, you’d think I would have more holiday decor. I have literally nothing to decorate with for 4th of July though! I decided to fix that with this easy 4th of July craft. 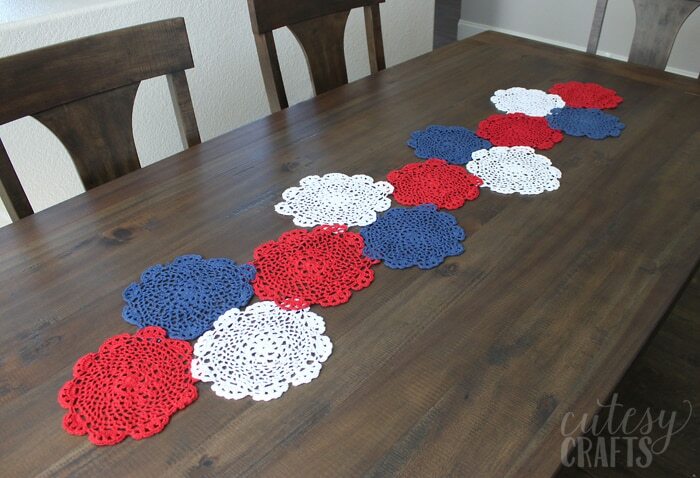 All I did was sew a bunch of red, white, and blue doilies together to make this pretty table runner. It turned out great, and it was so simple to make. 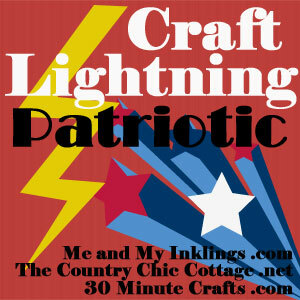 I’m posting this project as a part of Craft Lightning. As long as you’re confident in your sewing skills, it should take you no more than 15 minutes to finish! And even if you can’t sew, I’m sure you could probably even glue it and achieve the same results. 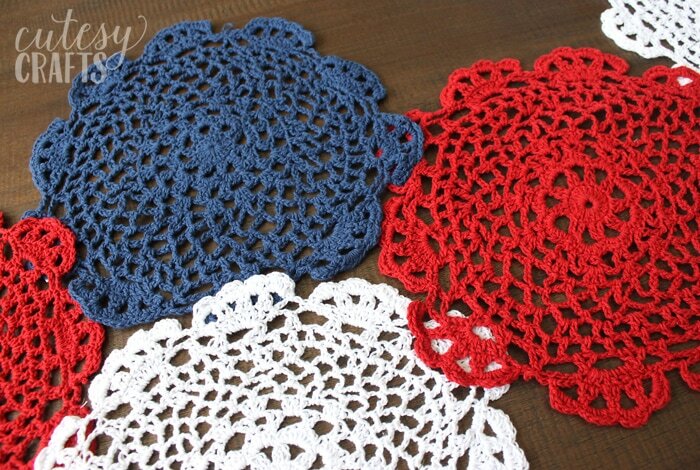 I got all of these doilies at Michael’s for just $1.50 each. I happened to go on a day that had a 30% off everything coupon, so yay! Of course, if you find other ones (or can even make your own), go for it! 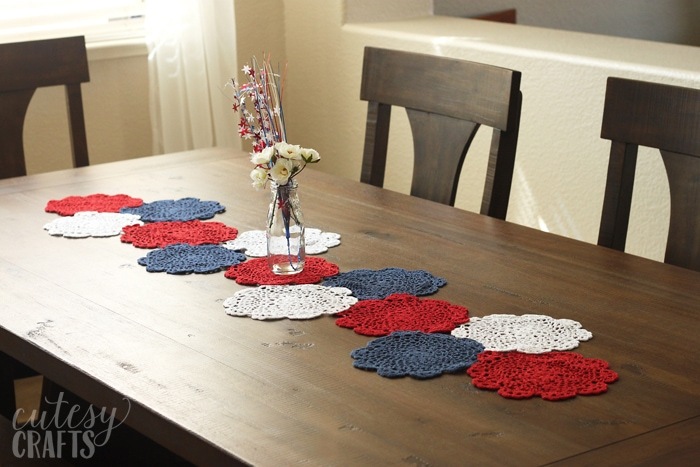 Buy more if you want to make your table runner longer. 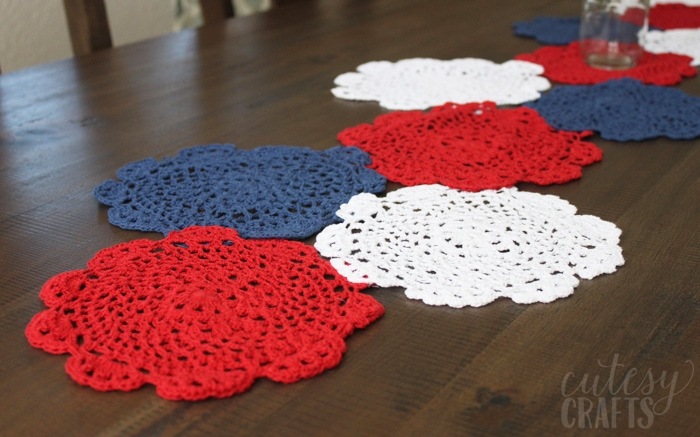 You’ll want to start by cutting the tag of each doily. If you want to get rid of the tags entirely, you can rip out the seams, but that will add to the time it takes. Don’t worry, we will hide the stitches that show on top of the doilies. 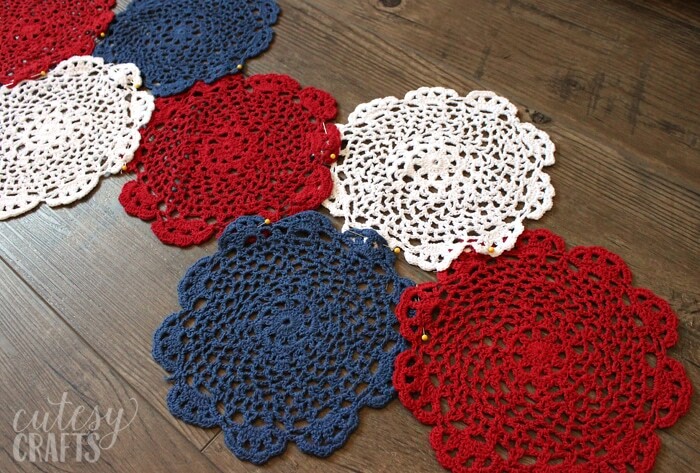 Lay out your doilies like the photos below, and try not to get too OCD about it. Easier said than done, I know. 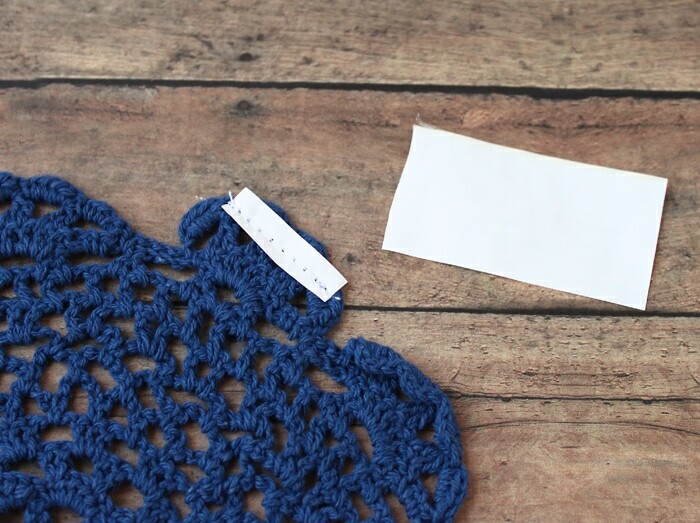 Turn each doily so that the tag is hidden under an overlapping doily. Pin the parts that overlap. 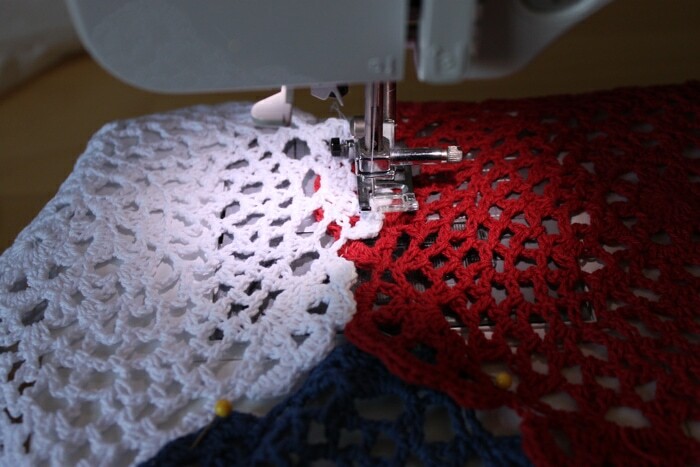 Sew the overlapping parts of the doilies, changing out your top thread to match the color of the doily on top. Here’s a closeup of the overlapping edges. I only sewed an inch or two for each overlapping part. Trim the excess thread, and you are done! I love the pop of color that it adds to my dining room! 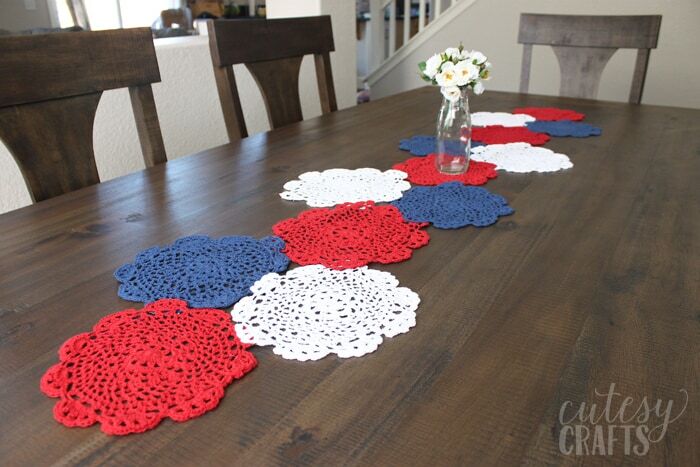 Now I just need to make some more 4th of July decor to go with it. 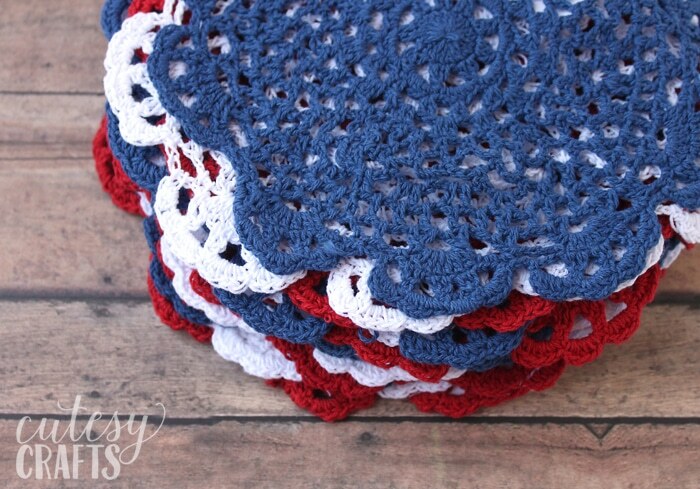 For more 4th of July crafts, check out these posts. I like this idea a lot. I’m going to try it for the 4th,I hope to get it done. Thanks! Once I figured out what formation to put the doilies in, the rest was a breeze! Good luck!